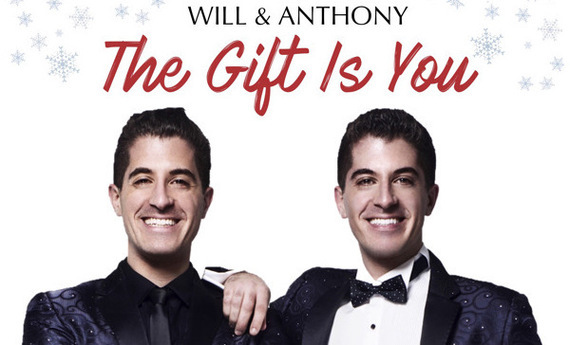 This week I talked with entertainers Will and Anthony Nunziata about their upcoming Carnegie Hall debut with The New York Pops on December 16th and December 17th in NYC and new Christmas EP The Gift Is You. The new XMAS EP features holiday classics as well as three original songs including the title track The Gift Is You. The Carnegie Hall concert on December 16th and 17th entitled Make the Season Bright is led by New York Pops Music Director Steven Reineke with a quartet of guest stars including Broadway siblings Ann Hampton Callaway and Liz Callaway. In recent years the brothers have brought their distinct take on classic and contemporary songs to performing arts centers and theaters as well as symphony concerts with orchestras such as the Detroit Symphony, Cleveland Pops Symphony, Colorado Symphony, Lancaster Symphony, Annapolis Symphony, Cape Cod Symphony, Toledo Symphony and Edmonton Symphony Orchestra. I talked to Will and Anthony about how performing at Carnegie Hall with the New York Pops this holiday season is a dream come true as well as a thrill to release their first Christmas EP and their spin on our LGBT issues. Well I know for Anthony and I we've gotten to meet a lot of people throughout the country from the LGBTQ community and we've had great conversations with them. I think it comes down to first and foremost a conversation and listening to peoples stories and hearing where they're coming from, how they're feeling especially in these times when we obviously have a lot of people in the country and in this world who may not agree with or support marriage equality for instance. I fervently believe that love is love is love and love is a human right for all people and so for Anthony and I to continue to commit ourselves to entertaining and inspiring, we hope that can help lead to leading policy makers in this country and in the world to truly make it possible to have laws, all laws, equal rights for everyone on all accounts. Will and Anthony Nunziata are the Brooklyn-born, classically trained singers, entertainers, recording artists, funny-men and advocates of arts in education. Separately, Will is an acclaimed stage director and is the concert director for many of Broadway's leading ladies including Tony Award Winner Lillias White. While Anthony an emerging songwriter, is currently collaborating with legendary songwriters. They are also extremely proud to have created their arts in education outreach program Arts Matter! wish their mission to provide young people with the tools and encouragement to set and reach their goals in the arts. Will and Anthony also conduct master class workshops for singers and actors in elementary school, middle school, high school and college giving students constructive criticism on their song selections and acting technique, all the while creating a safe and fun environment for everyone.